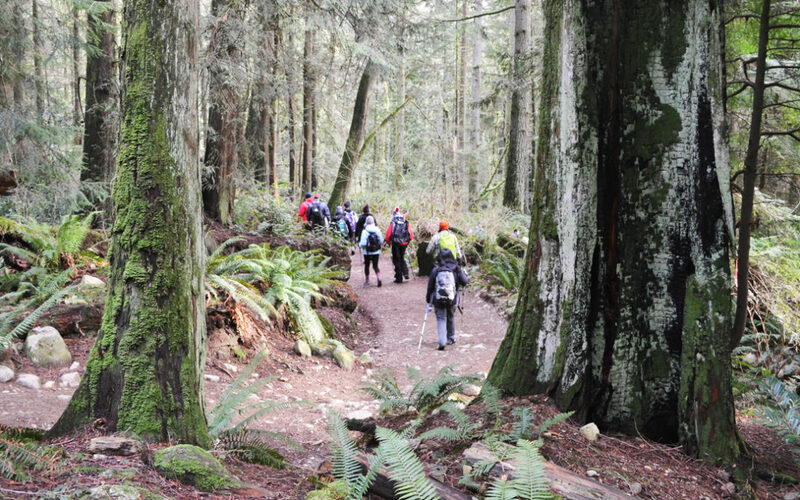 On January 1st, hundreds of hikers across British Columbia and Ontario welcomed 2019 by heading outside to take First Day Hikes in provincial parks. And with improving fitness and nutrition, as well as spending more time with family and friends rounding out the top five most popular resolutions for Canadians, what better way to celebrate the new year? The inaugural First Day Hike—meant to kick off the new year in a healthy way by getting people outdoors to experience nature and local history—took place in Massachusetts in 1992. By 2012 the phenomenon had spread across the US State Park system, and in 2018 almost 55,000 people participated in guided hikes in all 50 states across the country. With this in mind, the BC Parks Foundation’s Healthy By Nature initiative and Canadian Association of Physicians for the Environment (CAPE) joined forces to launch the tradition in British Columbia this year. CAPE helped make this event a success by working with the BC Parks Foundation and Ontario Parks to recruit physician leaders, drum up publicity and deliver key messaging around green time and health. Prizes for hikers ranged from gift cards to annual park passes—not to mention the chance to meet other nature lovers and improve their own health. Follow our team to stay updated on other related projects this year, from sitting on the steering committee of the 2019 Healthy Parks Healthy People Forum, to launching a provincial Parks Prescription program, to many more community engagement experiences to come. Hiking is a fun activity people of all ages and fitness levels can enjoy. Memories made on the trails will stay with you forever. First Day Hikes make a great holiday tradition. A First Day Hike promotes a year-long embrace of health and happiness in the outdoors. Plus, hiking offers head-to-toe health benefits.